Although Norman Forbes-Robertson was never as well known as his brother, Johnston Forbes-Robertson, he was a distinguished Shakespearean and played many roles; so many, in fact, that it will be easiest simply to list the plays and parts by years. He made his stage debut in 1875 at the Gaiety Theatre, London, as Sir Harry Guildford in Henry VIII. He also played in Twelfth Night that same year. In 1879 he joined Sir Henry Irving in The Merchant of Venice, and in 1881, he played Paris in Romeo & Juliet with Wilson Barrett. From 1883 until 1887 he joined Irving’s company at the Lyceum Theatre, and in those years he played Claudio in Much Ado About Nothing, Gratiano in The Merchant of Venice, Rosencrantz in Hamlet, and Sir Andrew Aguecheek in Twelfth Night. In 1890, he joined Lilly Langtry for a production of As You Like It. In 1896 he again joined Irving’s company and acted Cloten in Cymbeline, played in Richard III, took the parts of Gobbo and Shylock in several productions of The Merchant of Venice, and again, Sir Andrew Aguecheek. Norman was a prominent member of the Garrick Club in London and was good friends with Irving, Dame Ellen Terry, and Oscar Wilde. Along with Bram Stoker, he helped to organize Irving’s funeral in 1905. In 1904, he once more played both Gobbo and Shylock. 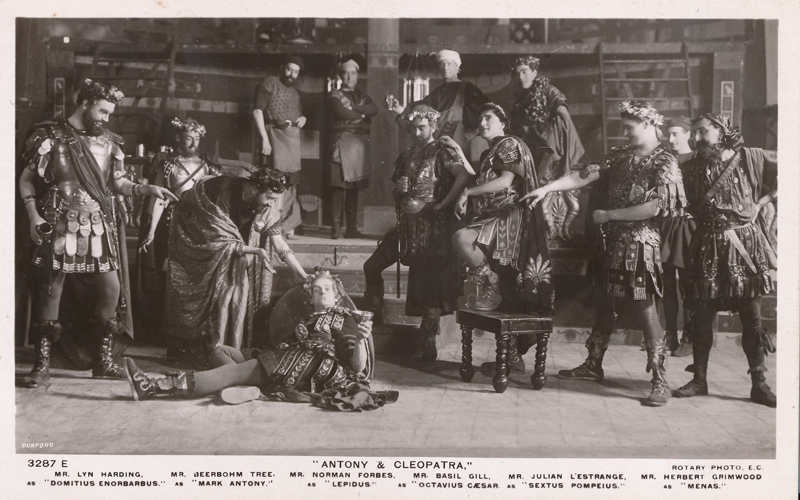 In 1906, he joined Sir Herbert Beerbohm Tree, a fellow Garrick Club member, to take the part of Lepidus in Antony & Cleopatra (shown in the card here). Besides these roles he played at various times in his career Wolsey in Henry VIII, Falstaff in The Merry Wives of Windsor, and Mercutio in Romeo & Juliet. In 1916, he acted in several films, but his career in the cinema seems to have lasted only that one year.